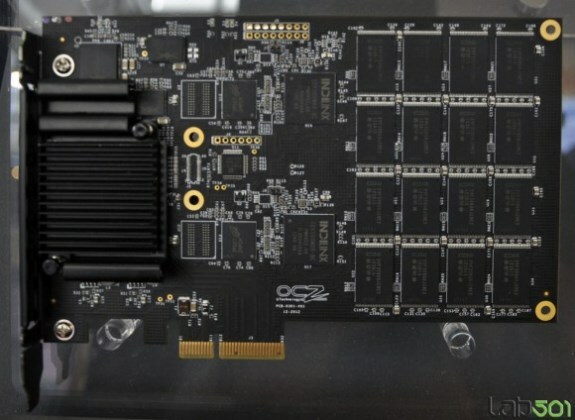 Lab501 got to see OCZ's Vector PCIe 960GB SSD at CeBIT. This disk is a PCI Express version of two Vector SSDs in RAID 0, with OCZ VCA 2.0 for full SMART and TRIM support. Available in 240GB, 480GB and 960GB capacities, these drives pack quite a punch. The 960GB model shown off at CeBIT achieved sequential read speeds of up to 929.96MB/s, sequential write speeds of up to 883.94MB/s. Head over to Lab501 to see a screenshot of AS SSD Benchmark, AS SSD Copy-Benchmark and ATTO performance. There's no screenshot of the max IOPS, but OCZ says you can expect the disk to be capable of 140,000 IOPS.